Looking For Coach Hire in Guildford? Have you been searching for a competitively priced and trustworthy coach hire in Guildfordservice? 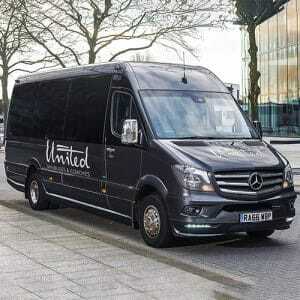 Here at United Minibuses and Coaches, we’re proud to offer you an affordable yet high quality minibus hire in Guildfordservice. We’re your first choice for convenient, stress-free transportation around the local area and thanks to our impressive luxury vehicle fleet, you’ll have a great journey with us. 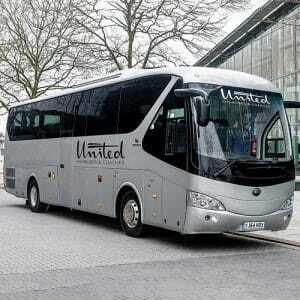 Why Choose United Minibuses and Coaches For Minibus Hire in Guildford? 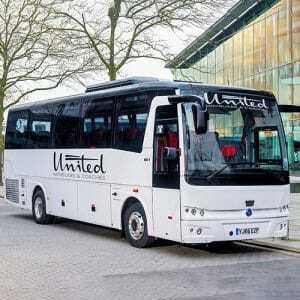 Whatever the size of your group, you can be confident that United Minibuses and Coaches have the right size vehicle to accommodate your needs. 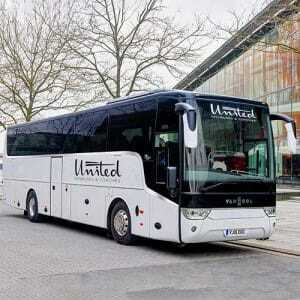 From our 16 seat minibusesto our 57 seat coaches, we’re sure to have the perfect vehicle to get your party from A to B. Whether you’re arranging wedding transportation to your venue, a convenient and simple way to get to or from the airport, or a great way to get all your friends to your party venue with no need for a designated driver, United Minibuses and Coaches are happy to help. Our range of vehicles is extensive and since each one is well-equipped with all the latest conveniences, you can be sure you’ll be travelling in style and luxury. Guildford is surrounding by some of England’s most stressful and busy roads, but there’s no need to make your journey more hassle than it’s worth. 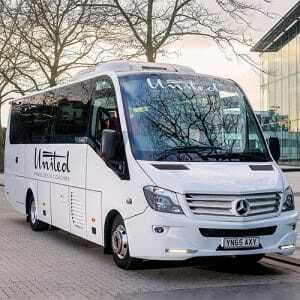 When you book coach or minibus hire from United Minibuses and Coaches you’ll benefit from a luxury vehicle together with an inclusive driver to get you to your destination without any worries. Our minibuses and coaches are well-equipped with safety equipment like CCTV and seatbelts as well as entertainment options like CD and DVD players, flat screen monitors and USB connectivity. It’s never been easier or more comfortable to travel with your friends or family thanks to our on board refrigerators and climate control. Guildford and its surrounding area have no shortage of popular attractions and tourist spots, and when you choose our coach hire in Guildfordservice, you’ll enjoy experiencing and seeing them all completely hassle-free. Here are a few of the most popular spots for you to discover around Guildford. Merry Harriers Llama Trekking– mad about llamas? Looking for a really unique way to experience the local area? At Merry Harriers Llama Trekking in Hambleton, you’ll get up close and personal to these beautiful creatures and explore the countryside at the same time. Hampton Court – travel a little further afield and discover centuries of history at this famous royal palace. Once home of Henry VIII, you can take a trip back in time here at this must-see attraction for history buffs. South Downs National Park– the South East boasts some stunning countryside, but arguably the South Downs is home to some of the most beautiful rural spots. Visit bustling towns and pretty villages and bask in the splendid landscapes. Goodwood Racecourse– whether you’re a golfer, a fan of horseracing or a motor racing enthusiast, Goodwood is the top spot for you to discover. There’s even a fascinating historical house for fans of heritage and culture to explore. Heathrow Airport– the UK’s biggest and best known airport is a top choice for anyone arriving or departing the UK, whether travelling for business or for leisure. Discover Guildford and its surrounding area in style and comfort when you opt for coach or minibus hire in Guildfordwith United Minibuses and Coaches. We help you get to your destination safely and in luxury, so whether you’re travelling with friends or family, you’ll enjoy a hassle-free trip. Call our team today to find out more about our vehicle with driver hire service and explore the local area.